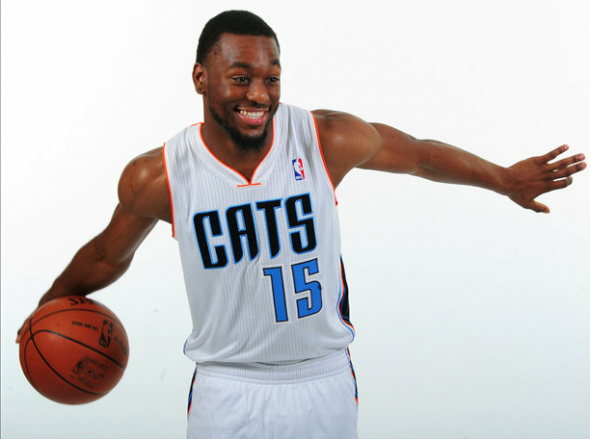 The Michael Jordan owned Charlotte Bobcats unveiled a new jersey lineup for the upcoming season. The new scheme pretty much does away with the ugly orange and off green (or whatever color that was) from their previous color set, and ushers in blue on blue on white. Unfortunately for the Bobcats, the NBA has enough blue on blue color schemes (and the Dallas Mavericks already exist), so the jerseys look pretty boring compared to other teams. I would say these are an upgrade over the previous abominations the team sported in years past, so there is some hope. The team also appears it wants to do away with the “Bob” in Bobcats, as the home jerseys simply say “CATS” on the front. Nothing like getting beat by a bunch of cats eh? Kemba Walker shows off the new threads. Nothing like a ferocious house cat to instill fear into LeBron James. I hope these jerseys are temporary and the Hornets moniker can be rightly brought back to Charlotte after the New Orleans franchise sheds it’s current name. Saints owner George Shinn recently bought the Hornets and has said he is looking to change the name. Maybe the New Orleans Hunters? Anyway, a link is provided for more shots of the new CATS gear, coming your way in October.